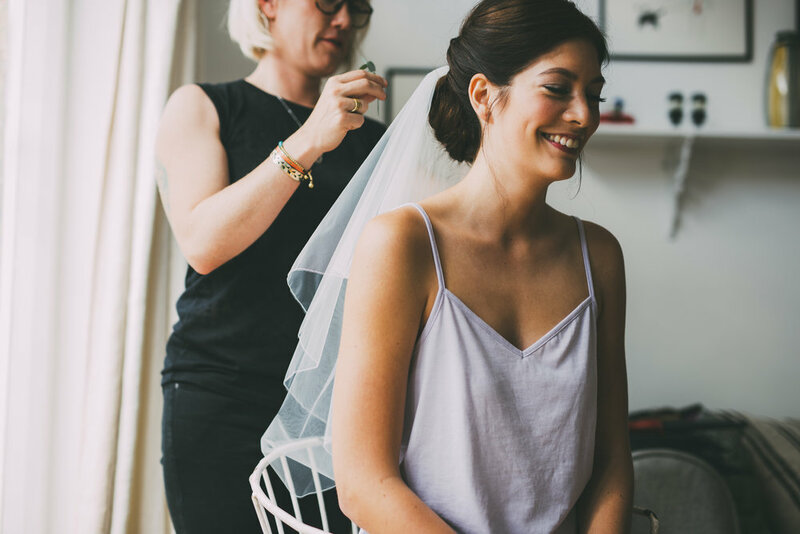 I always love receiving messages from my lovely brides telling me they have been featured in a magazine or blog, and this one i received a few days ago is no exception! 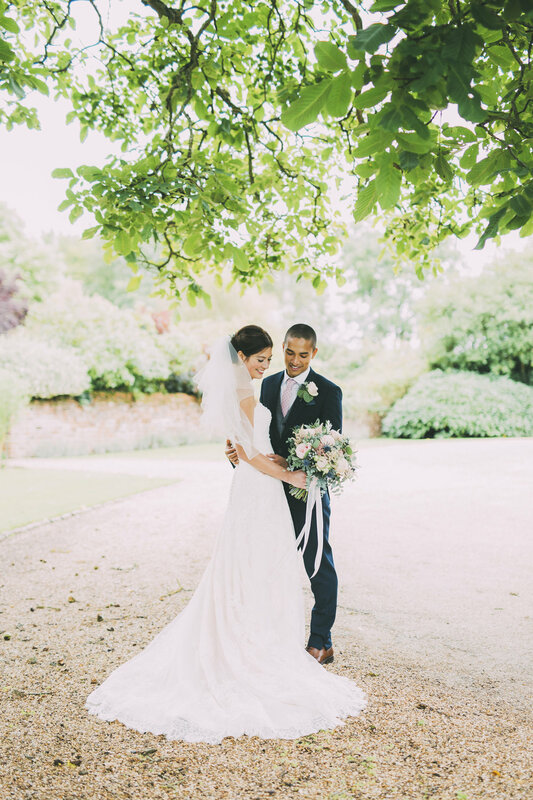 In the meantime, here are some gorgeous pics from the talented Will Fuller Photography that capture Hillary and Dev’s special day perfectly! So there’s my pearly bits of wisdom to start the year off lol! SSSHHHHHHHHH DON’T MENTION THE C WORD YET!!!! send thairapy an email and we’ll be happy to help. See you over the festive season, in 98 days! 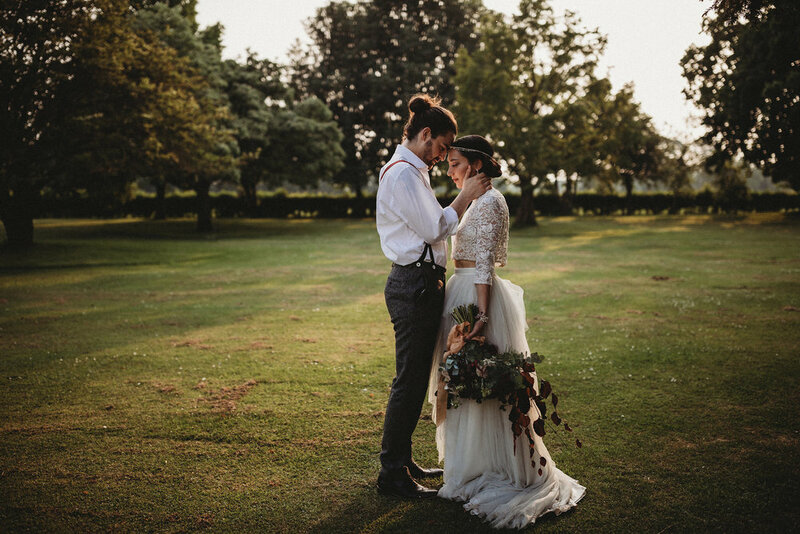 This gorgeous shoot was a joy to work on, not only because of the fab creative team, but because this has to be one of my favourite hair styles for the era, and the colours chosen for the event venue styling are something i love too! I think you'll agree it gives a warming feel of elegance, alongside the charm of the outdoors. 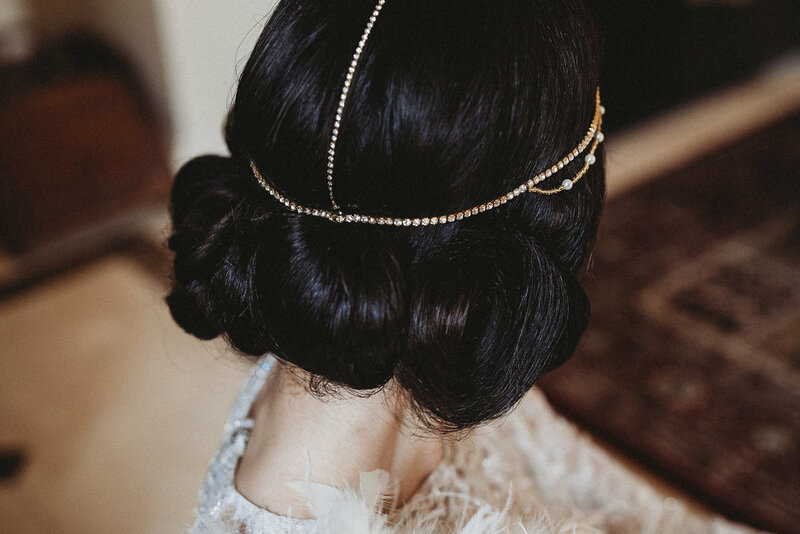 Today i received this gorgeous image from Simon Carter www.simoncarterphotography.com i love recreating vintage hair styles, the long ones are in particular one of my favourites. 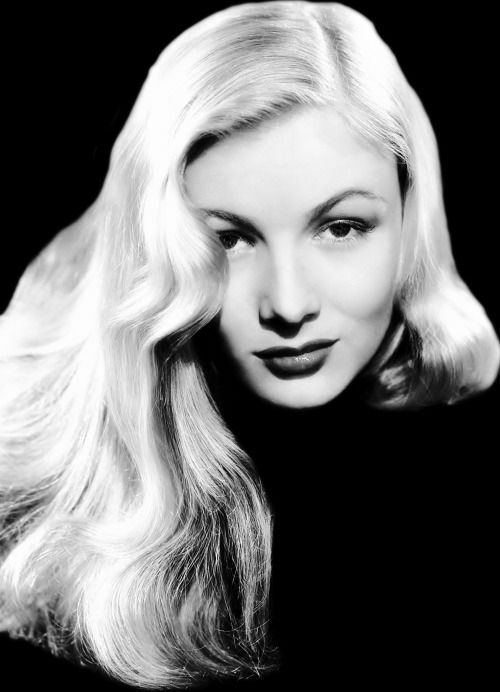 This shoot was for Simon's portfolio, he wanted a Veronica Lake feel to the hair and style of picture taken. The stunning model is Sinopa Rin, she effortless got into character for this shoot, and even did her own make up. 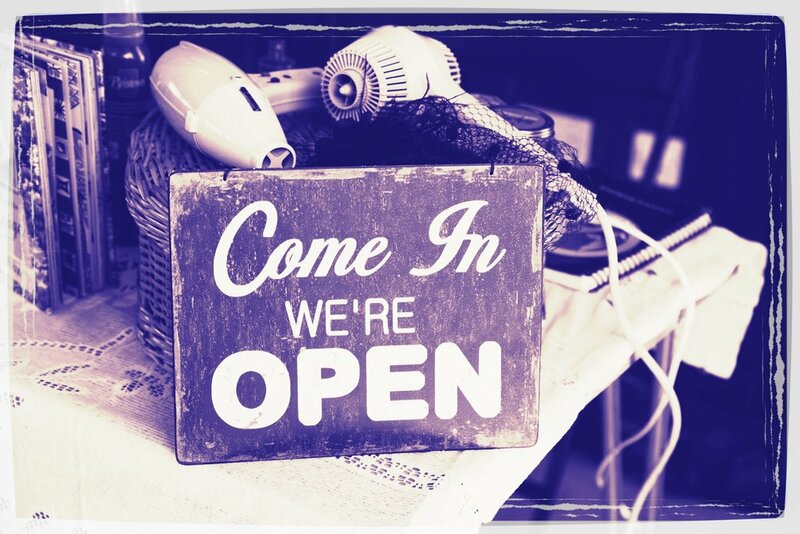 thairapy now hosts hairstyling roadshows! This week thairapy hosted the first ever hairstyling roadshow. The venue of choice was THIRSTY in Cambridge. THIRSTY is a really quirky craft beer and wine shop that not only sells great drinks, but also hosts lots of different events during the year, so make sure you check out their facebook page to see whats up next. They also have regular food trucks that stop by on these occasions too! On the night of thairapys first event (which was last week 5th July 2018) Holy Schnitzels parked outside and fed everyone which was delicious! On arrival there will be a complimentary drink, in this case it was Prosecco, then you are welcomed into the thairapy hairstyling suite. 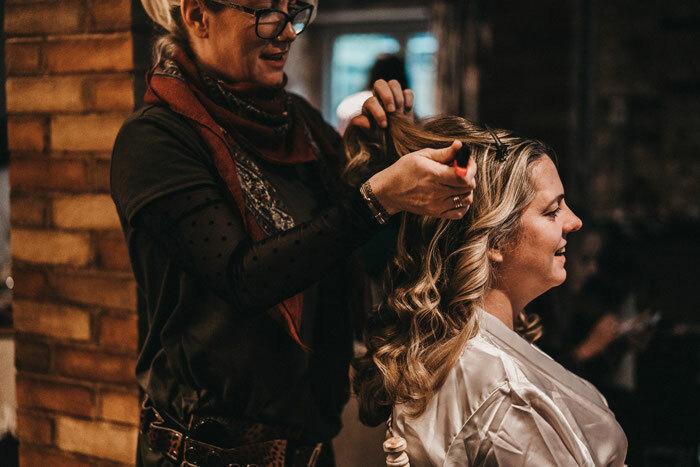 Inside the thairapy suite is a Pop up Salon which you sit in whilst Becks holds a relaxed Q & A, you can ask her anything! On this occasion THIRSTY kindly offered 25% OFF Cocktails ALL NIGHT! Oh you also get to take home a thairapy goody bag and purchase the bandanas you practice with too if you wish. All in all it makes for a fun and relaxed event. Someone compared it to hanging out at your mates house playing with your hair with your girlfriends before a night out, and that was exactly the feel Becks wanted! Hermione's pieces truly are a work of art! All of them are handmade here in the UK by herself and her talented team. 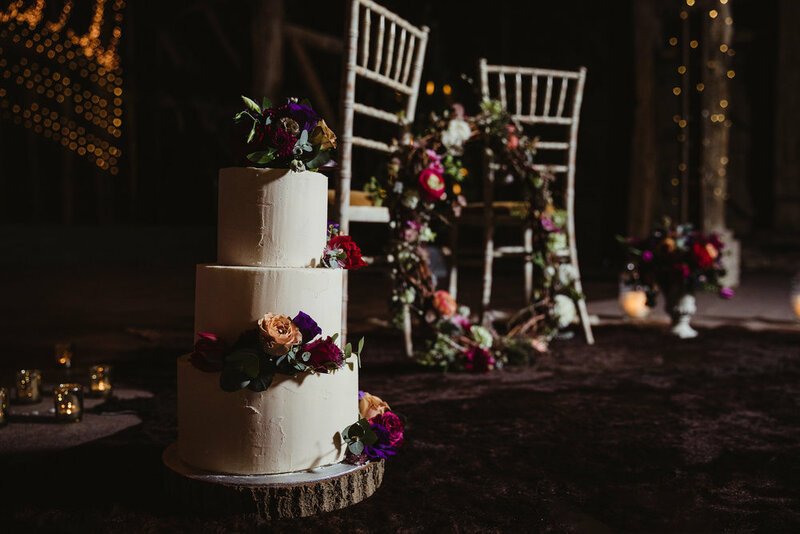 Outdoor Woodland Wedding Venue - Upthorpe Wood Event Day - thairapy will be there among other fab suppliers! 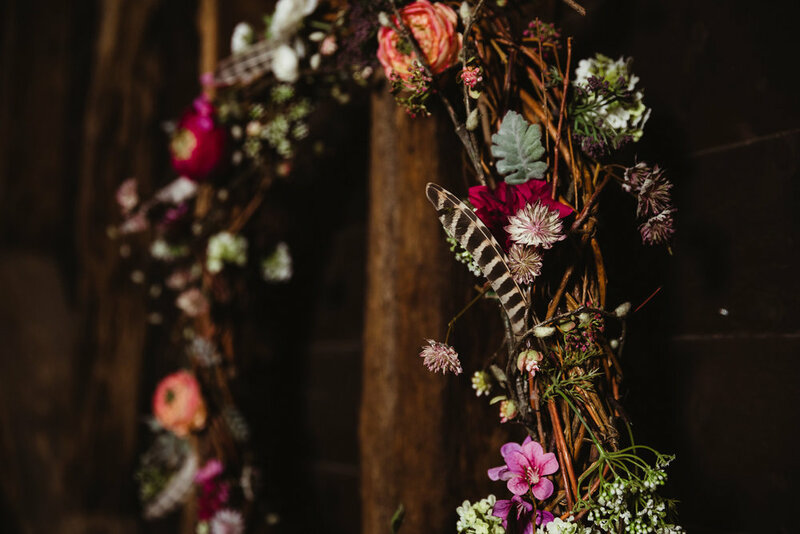 looking for an alternative to fresh flowers? 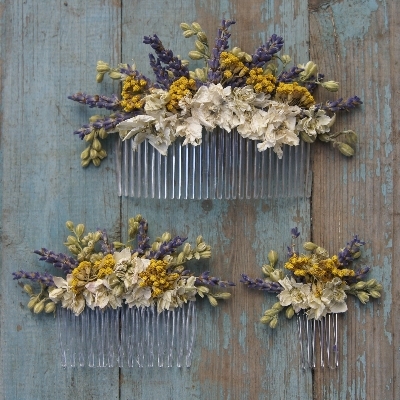 They are a fab alternative and also make a beautiful keep sake for yourself or bridesmaids. 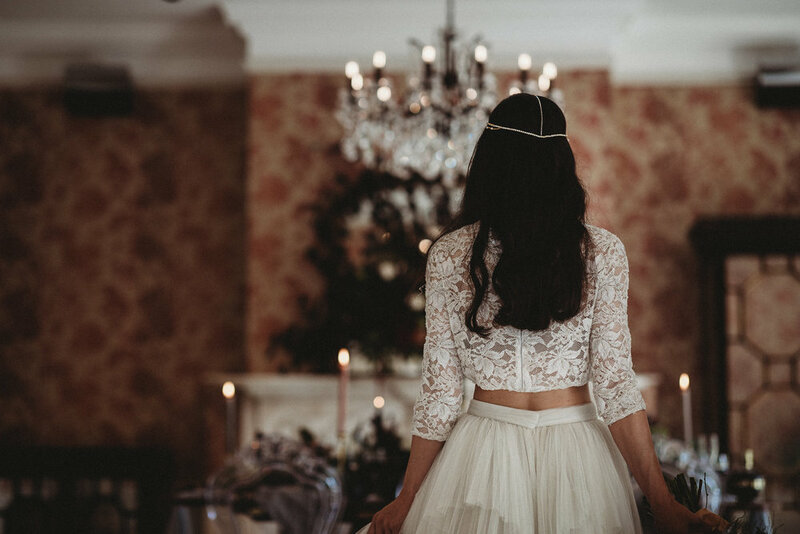 thairapy featured in affinity wedding mag - collab with some great other creatives! 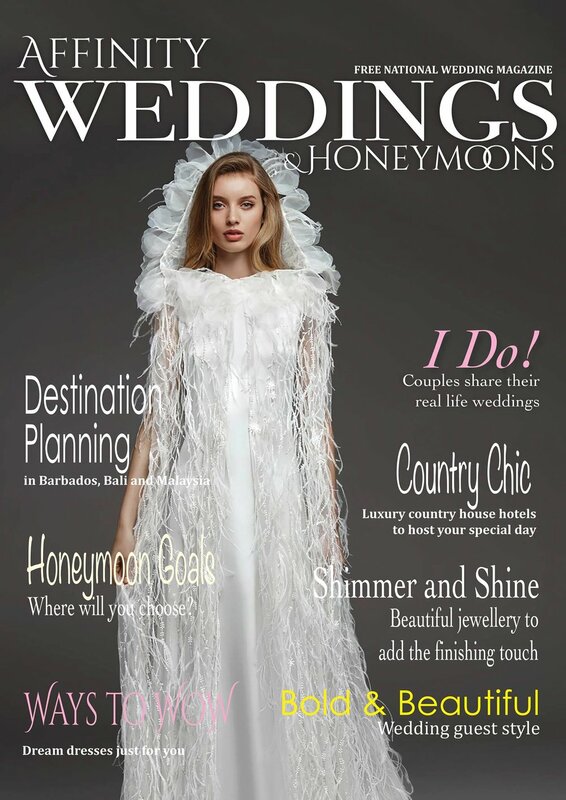 www.ruralandurbanevents.co.uk also ran by Paula Banks who also provided the prop hire and styling of the shoot. 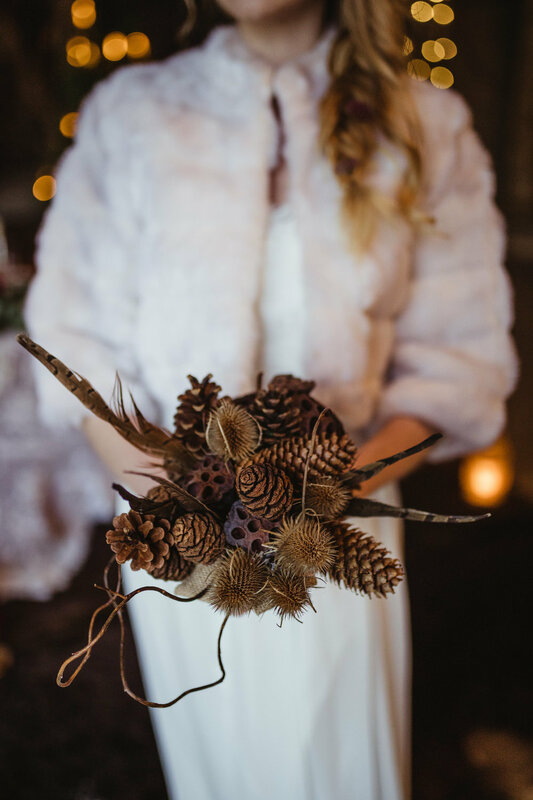 Winter colours and natural feathers, lace and faux furs were added to created a cosy winter wedding feel. 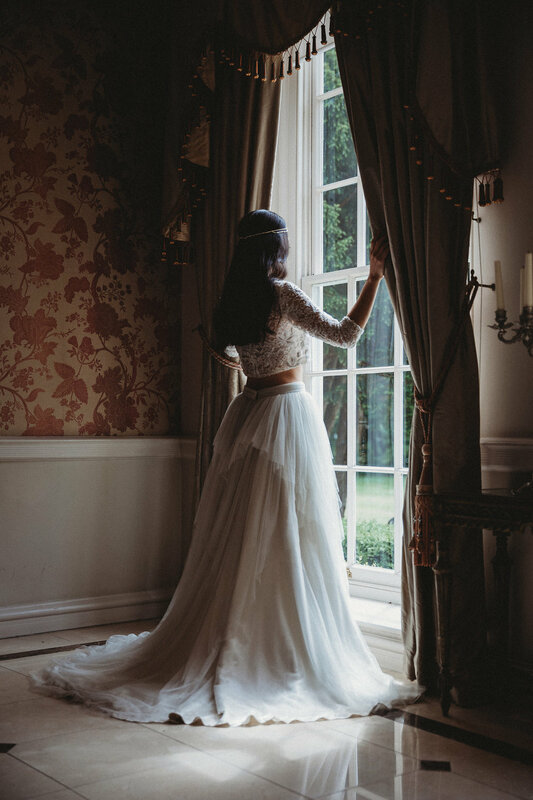 www.thymelanephotography.co.uk takes full credit for all of these amazing images too, Noemi captured the atmosphere perfectly! The makeup artist for the day was the talented Emily West www.aurorabridalandeventsmakeup.co.uk she created a strong eye detail with beautifully soft cheek and lip detail, it really compliments the whole look and style of the shoot. 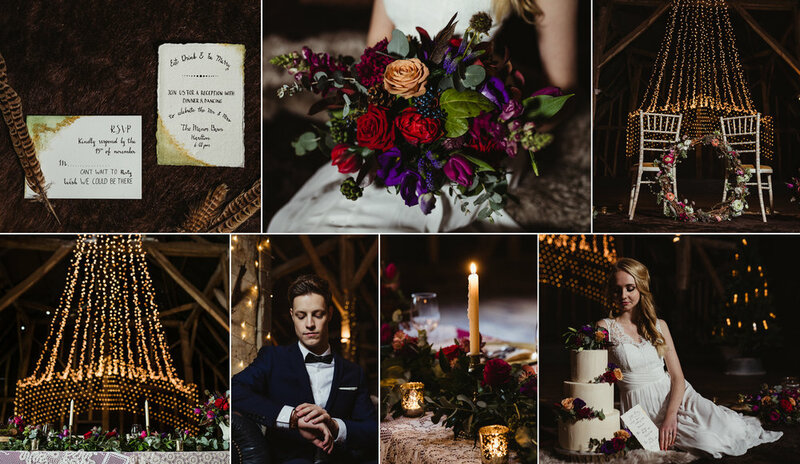 The attention to detail is beautiful, the colours are so vibrant and rich, definitely creating a warm and rustic feel to the set. This exceptional cake was provided by the talented Jess Baines. 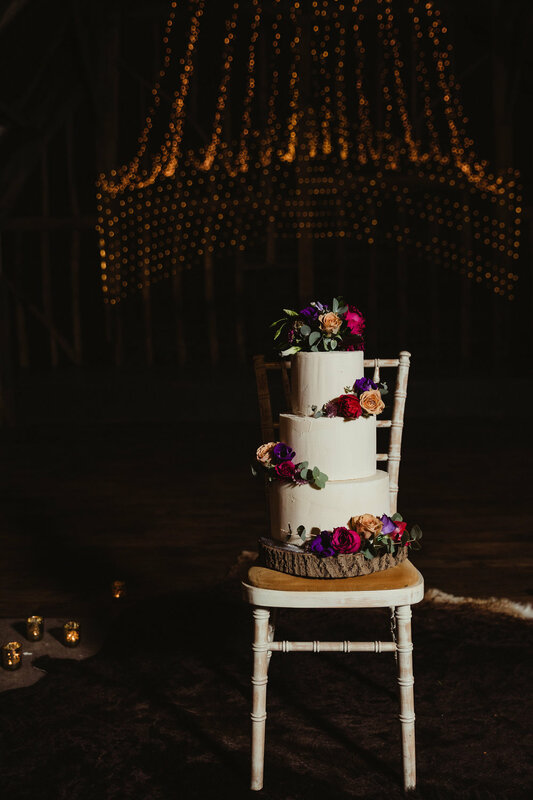 One Part Love is a family business so you will often see many of the Baines' and their extended family in the bakery, delivering cakes and out selling at food markets and festivals. 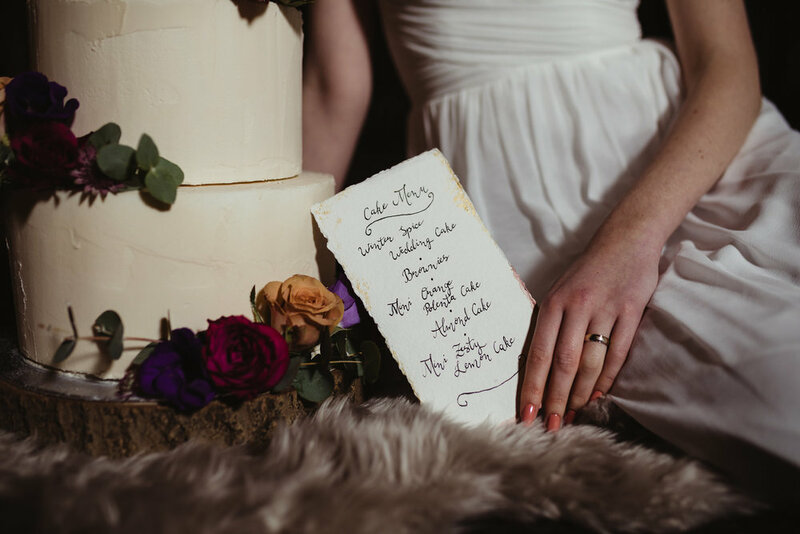 The beautiful calligraphy and pyrography (wood burnt calligraphy) was designed and created by Dorothy's Workshop. 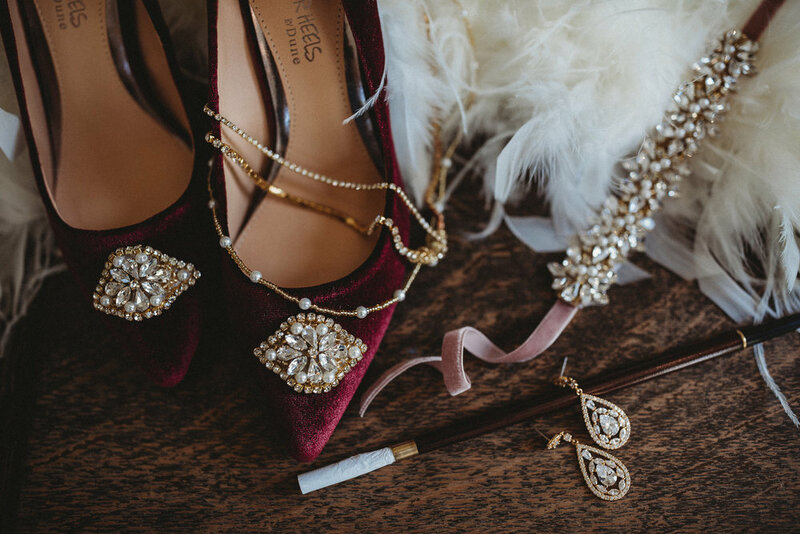 It has a lovely humble feel to the bridal stationary and the personalised wooden bowls make for a truly bespoke keepsake. 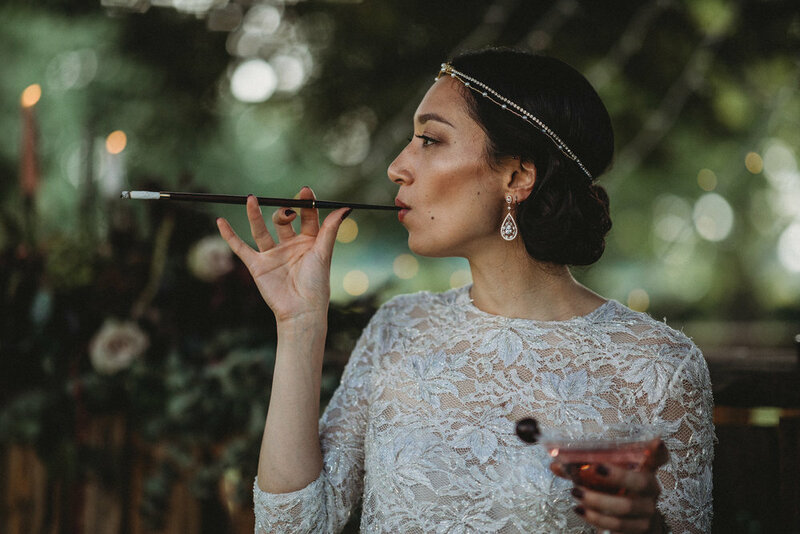 thairapy is now featured in bridebook! 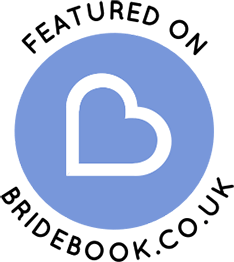 If you haven't already been using this new app for your wedding planning, it's a must have! It will make all the simple jobs a whole lot easier with the click of a button! thairapy has a new logo!! SO happy to share it with you all! 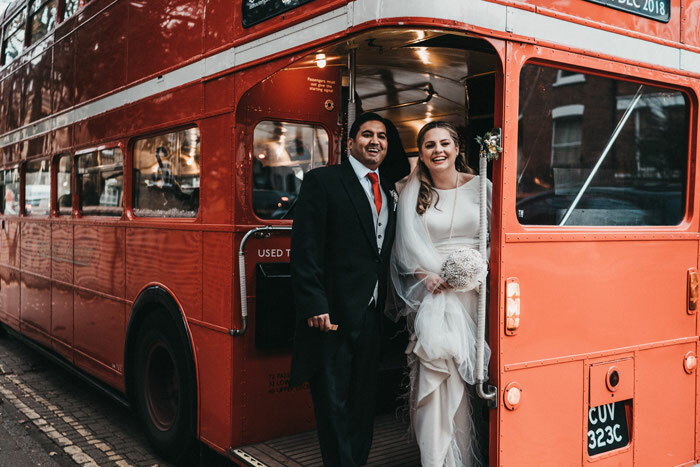 THAIRAPY -SHORTLISTED FOR THE UK WEDDING AWARDS 2018!! 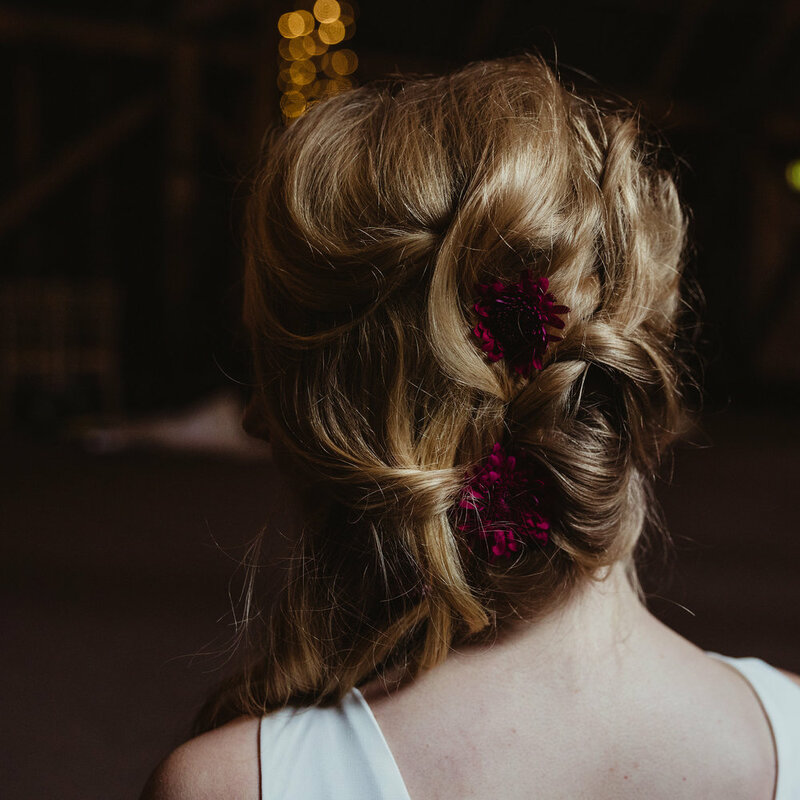 Hi everyone, so 2018 has started with a double high as i've been shortlisted as potential Bridal Hair Stylist of the year by The UK Wedding Awards! THE FIRST EVER PHOTOSHOOT IN AN AIRSTREAM...PROBABLY!! We have made it into Femme Rebelle Magazine - December 2017 edition, where we have an excellent 8 page feature! It's with immense pride, that i can now share these amazing images of the first EVER photoshoot in my incredible 1956 Airstream trailer, who goes by the name of Marilyn. I bought her 4.5 years ago, and its a bitter sweet story in how i came to own her, as she is purchased from inheritance from my late mother. I always choose to acknowledge this, as it's without her, these images and this collaboration couldn't of come together. And so, with this unbelievable sadness, it has brought some amazingly talented people into my life! Firstly, Simon Carter! Where do i start! He has such a passion for photography and is such a lovely human being, working with him doesn't feel like work! He knows exactly what he likes and nails it every time! 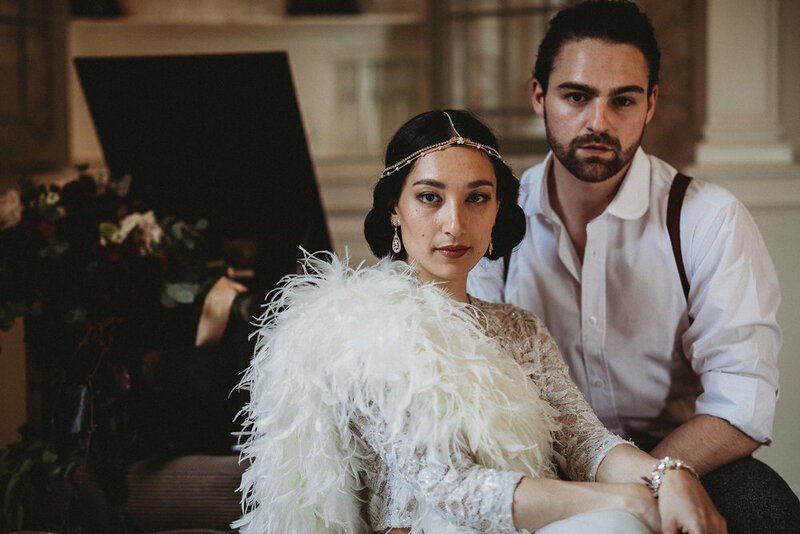 This fashion shoot wasn't normally Simons usual shoot as he is usually snapping away with dancers and performers, so it pushed him out of his comfort zone, but i think you'll agree it's brilliant! Secondly, Jada Rose - Model. She was ace! 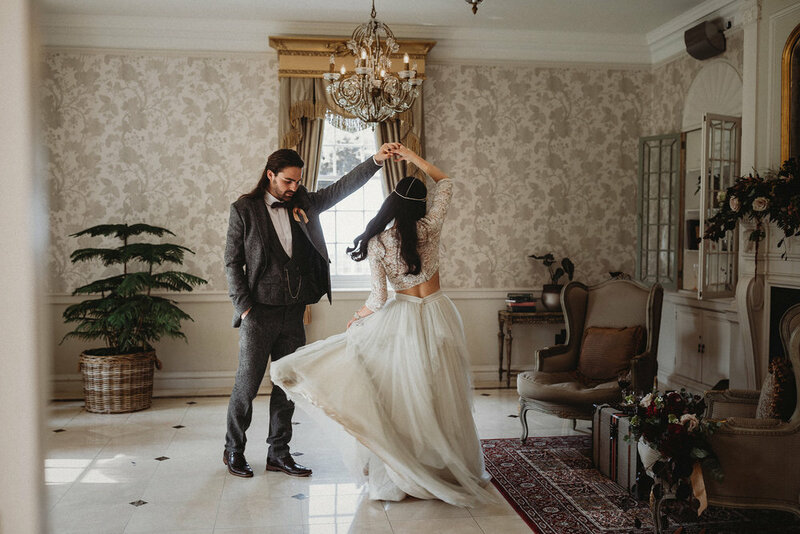 I couldn't of asked for a better person for the job :) We wanted to go with a Barbarella theme, and it evolved into what could also be from Close Encounters Of The Third Kind! Just the look we were going for! Thirdly: Kate Fletcher - MUA. Kate loves all things creative, so when i asked her to join me for the shoot, of course she jumped at it! 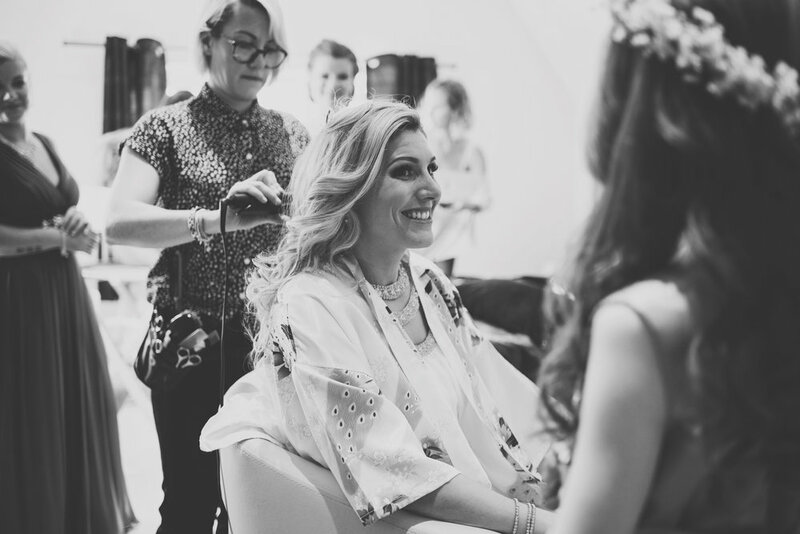 Kate is a great makeup artist, she's been working in TV, Film and lots of other things, including bridal and fashion, so if you need anyone for an event or wedding day makeup look no further! Forth: The stylish Hayley! She has the best collection of props and clothes and well, anything really! 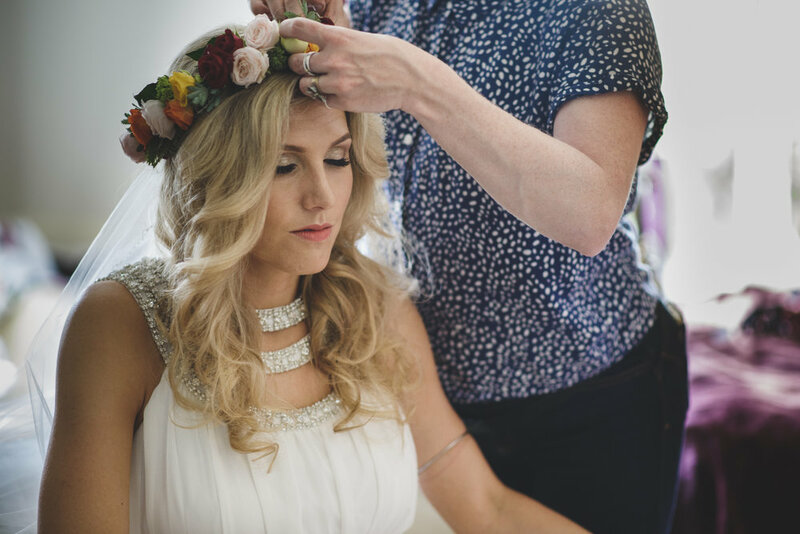 If you want any styling for an event, be it a wedding, garden party and all in between Hayley is the go to gal! Not only are her props of excellent quality, but she really does go the extra mile, and her attention to detail is on point! So much so, for a friends wedding, who's theme was Out of Africa, she hand painted plastic zoo animals in gold to add to the effect, which was fab!! She's a really honest and down to earth person too, so you can really trust her creativity for any event! You've guessed it, i did the hair styling for the day! We wanted to go with a slightly rock chick edge, so i chose the plait side detail with some textured curls and lots of backcombing, giving it the 60s vibe! Even my beautiful Cockerpoo Dita Dog got in on the action!! 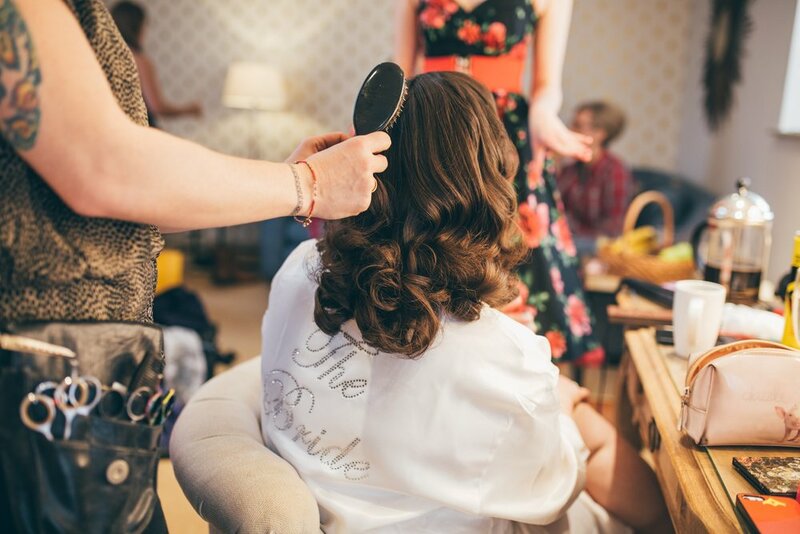 Rachel chose a classic style for her hair, this complimented her stunning bridal gown perfectly! 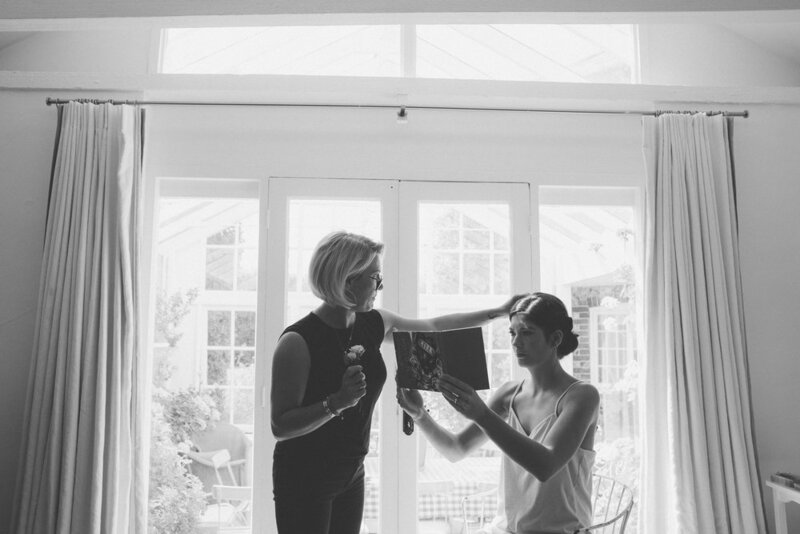 The sun shone and smiles were all round :) I had a lovely morning styling her and her bridal party of 3. 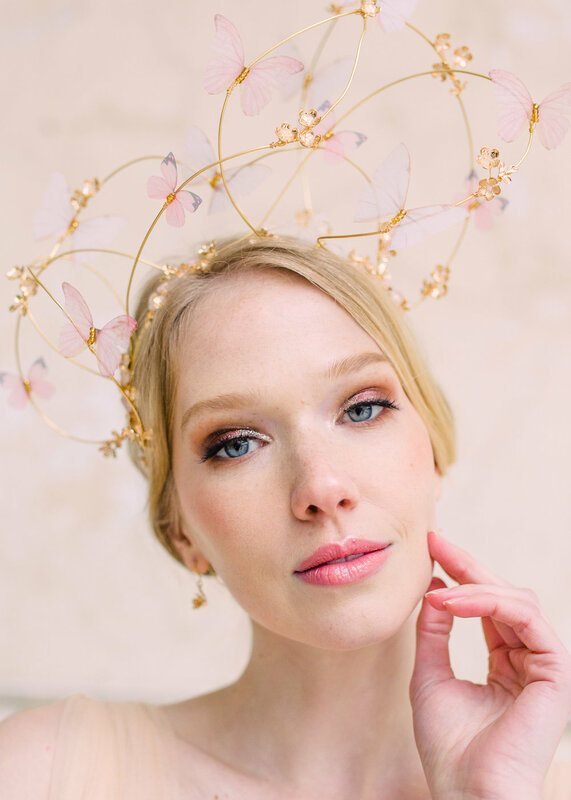 Another gorgeous head piece from Hermione Harbutts NEW 2018 Collection! 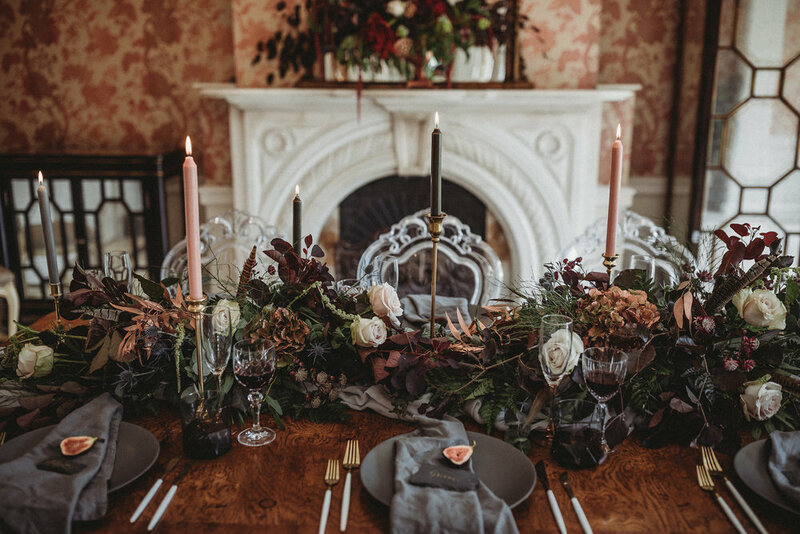 I had the pleasure of creating this look for the shoot at Westonbirt School back in April this year. I'm So excited to share with you the NEW 2018 Collection from Hermione Harbutt. I have pleasure of being her session hair stylist for her UK shoots. This one was held at the beautiful grounds of Westonbirt School in Tetbury in April 2017. Hermione's NEW Collection can now also be found on the Rock My Wedding Blog, so feel free to have a browse at her new creations! Each piece is bespoke and handmade in her design studio in Bristol, so you can be assured you will receive a one off piece!